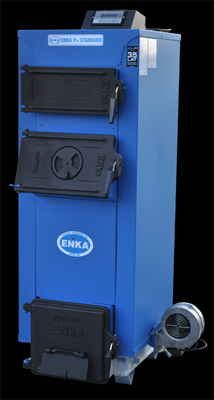 ENKA P+STANDARD is equipped with microprocessor which enables automatic operation. Apart from microprocessor controller, the Boiler enables traditional type of burning without using the controller, but only with help of manually controlled throttle or with draw adjustment. Body - Boiler 6 mm Steel. The Boiler is equipped with solid, replaceable grate. SIGNUM 105 Controller controls: - constant temperature - CH circulation pump - periodic safe blows Additionally, it is equipped with rpm controller of blower taking into account the kind of burned fuel. The greatest advantage of the Boiler is the acceptance of universal fuel, easy availability of service parts arranged in front of the Boiler, over the feedding door. The Boilers are designed for the open type of CH systems with an option of closed system. They are low-temperature boilers of max. 95°C.